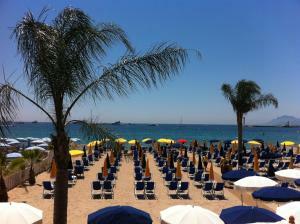 The Azurene is located 55 yards from La Croisette and Cannes beach. It offers air-conditioned soundproofed guest rooms. Each has a private bathroom, TV and free Wi-Fi. A continental breakfast is available in the mornings and the Azurene’s staff will be happy to recommend restaurants, bars and stores in the nearby streets. Guests of the Azurene Royal Hotel can find a golf course nearby and snorkeling, diving and fishing can be enjoyed at the nearby beaches. The Azurene Royal Hotel is situated a 5-minute walk from the Palais des Festivals and Cannes Harbour. Nice Airport is a 25-minute drive away and a shuttle bus is available. Please note that dogs cannot be left alone in the room at any time. If you expect to arrive after 20:30, please contact the property in advance to obtain the necessary access codes. Contact details can be found on the booking confirmation.